Easy to use income and expenses organizer. Is there a better alternative to Tax Prep Pilot? Is Tax Prep Pilot really the best app in Finance category? Will Tax Prep Pilot work good on macOS 10.13.4? 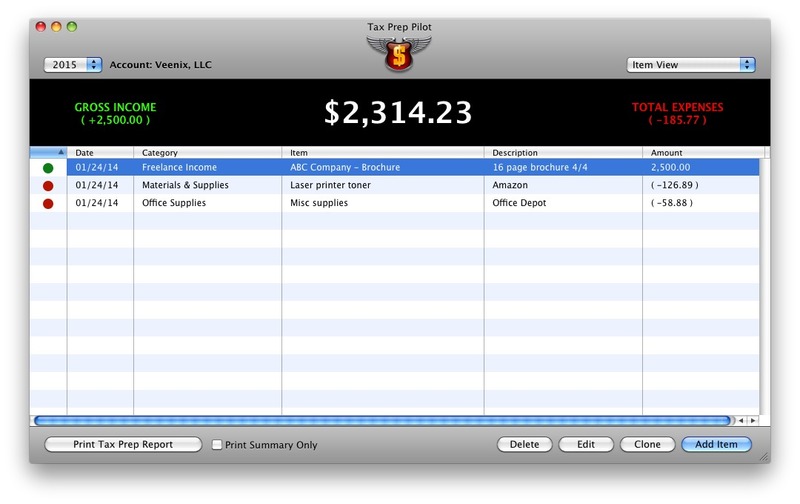 Tax Prep Pilot helps you quickly and easily track your income and expenses and print beautifully organized reports for your end of year taxes. Start a new year or view previous years simply by selecting a year from the pop-up menu in the upper left of the display. Perfect for freelancers, self-employed and anyone who files a Schedule C.
Tax Prep Pilot needs a review. Be the first to review this app and get the discussion started! Tax Prep Pilot needs a rating. Be the first to rate this app and get the discussion started!